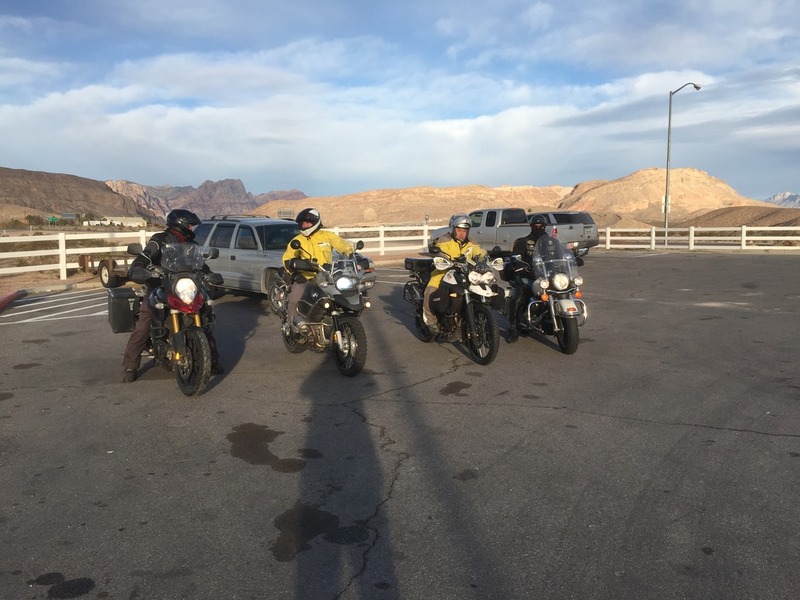 The New Year has arrived and its time for Vegashotwheeler's aka 'Mike's' annual New Years Death Valley ride! This year the ride is held on January 2nd, a Saturday. After the debacle of my last ride for the Christmas party in Vegas, I'm going to trailer down....ohhhhhhhh how it pains me so to admit that! Unfortunately, Mike has a co-worker who becomes ill, requiring him to cover the co-workers shift and he can't attend the ride. Several other riders catch the bug du jour and also have to back out of the event. The NYDV ride is actually two rides; the dirt ride, and the pavement edition. There were five dirt riders, I didn't get any pictures of them. Four riders show up for the pavement version. Your's truly, Steve aka DesertDweller, Brian aka HHH, and I can't remember the guys name on the Harley. Mike, good host that he is, shows up to see us off and snaps this picture. About 20 miles down the road the Harley turned around and left us. It was a cold morning. Mike changes the route every year, but one constant is we eat breakfast at the World Famous Crowbar saloon. We stop at Dante's overlook which is over 5000 ft above the Badwater basin that I'm pointing at behind me. Bad Water basin is 282 ft below sea level. These guys from India brought their own entertainment. They played and sang for awhile, then the guitar player handed me the guitar....! For the life of me I could not think of any song to play, so I just stumbled through some chords for a few minutes and then handed it back. I just HATE performance anxiety! We leave Dante's overlook and ride to Bad Water Basin, now I'm pointing back up to where we were a few minutes ago, Dante's overlook. The elevation difference is about a mile and 1/4. If you look closely you can see the sign that indicates sea level. He and Brian could easily do triple digits on this 'not recommended' road. We next ride to Artists Palette. We end the day in darkness. We are all cold so we go for some Pho, my first....it was hot and delicious! My brake light is stuck on, Steve has the tools and knowledge to help me fix it. This is his cool honda CT 110. 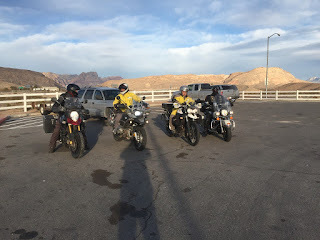 He and 4 others on CTs plus one 'Monkey' bike rode a 1640 mile adventure up the California coast. After the brake light is fixed I follow Steve to see the ghost town of Nelson Nevada. I've been to Vegas a million times and never even heard of this ghost town, so I'm thankful Steve showed it to me! We ride back to Vegas in the fading light. Tomorrow I'll ride to Salvation Mt. I'm on my way to Salvation Mountain. I stop at an old (mustang?) round up station. There is only a narrow two lane road, no house or building for miles and miles and I see this lion guarding....the great nothing... anyway surely the proud lion is a sign of good luck! There is a geo-cache on the pedestal, I sign in and leave my blog address. There wasn't a trinket in the bag, which was a good thing because I didn't have one to leave. I'm getting close to Niland, the Salton sea is on my right, I'm 218 ft below sea level, its 61 degrees, and I'm having a devilish good time! I stay overnight in Brawley, California, then go northbound the next day. I pass the world famous international banana museum. I didn't go in the museum, instead I peeled out and went on my way. North of Mecca, I'm riding on Box Canyon road which has some incredible out of this world scenery when I see a dirt road; and think "cool photo op!" Back into the Joshua Tree National Park...raining and foggy through the park and for most of the remaining 200 miles to Vegas. And back to 'sunny and warm' Vegas (its actually cold and wet). I struggle getting Beaky back onto the trailer because the wooden ramp is so sodden wet it is very slick. I have to find a place where the trailer can be low enough that the ramp is not so steep. I find a good gutter to park the trailer tires in and go right up...no problem! In the morning I leave for home, stopping in Mesquite for breakfast with a long time friend - time well spent! A good ride, 1060 miles on the bike.